Why Buy From Peoria Toyota? At Peoria Toyota, we look to serve our customers, community and city. Our Toyota dealership in Peoria, IL, has been locally-owned since 1980 and has been the go-to family store for Central Illinois drivers for the past 40 years. As a continual winner of the prestigious Toyota President’s Award, we uphold a strong commitment to meeting the highest standards of customer satisfaction, whether you visit our Toyota model showroom or our Toyota service and parts center. Our friendly and low-pressure environment sets us apart from our competitors, and our highly trained and tenured staff makes us the award-winning Toyota dealership we are today. 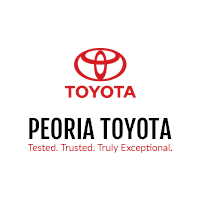 Our Peoria Toyota dealership has a long history of superior Toyota sales and service, but what we really pride ourselves on is our commitment to the community. Peoria Toyota is a proud member of the Pearl Automotive Group, which donates to almost 60 different charities and organizations each year. Whether we’re raising funds for the Special Olympics of Illinois, St. Jude Children’s Research, sponsoring the Peoria Heights Policeman’s Benevolent or participating in the Susan Komen Race for the Cure, our team is always out in the community trying to make a difference. We love interacting with everyone who calls the Heart of Illinois home, which is why we invite you to say hi during our next Tee Off For Hope golf tournament or Manual High School Summer Sports Camp –because to us, you’ll always be more than a customer. Looking for More Reasons Why You Should Buy from Peoria Toyota? Your time is valuable, which is why our Peoria Toyota dealership doesn’t look to waste yours! We offer loaner vehicles to help you stay on track during the week when your Toyota needs repairs, and a convenient shuttle service for when your Toyota just needs a quick service checkup. If you want to wait for your Toyota service and repairs to be finished, make yourself comfortable in our Pearl Café. Our onsite café serves complimentary coffee, cappuccino, espresso, water, fresh-baked cookies and more to ensure your time spent at our dealership is enjoyable. Bring your kids to shop for a new Toyota with you! Our local Toyota dealership offers a newly remodeled children’s playroom to keep every member of your family entertained. We love to help our customers save, which is why we offer a Toyota College Grad Discount and a Toyota Military Discount, among other impressive Toyota specials. The team at Peoria Toyota understands you have a busy schedule. That’s why we offer extended weekday hours and Saturday service and parts hours to help fit your repairs into your schedule. We’re your used car destination! When you buy a pre-owned Toyota from us, you’ll benefit from Internet Market Value Pricing. This means we’ll compare the price of the used car you’re interested in against the market and give you one low and non-negotiable price you can be happy about. At Peoria Toyota, we’re Tested. Trusted. Truly Exceptional. Visit our Central Illinois Toyota dealership to buy, lease or service a Toyota today!